Crizotinib (trade name Xalkori, Pfizer) is an anti-cancer drug acting as an ALK (anaplastic lymphoma kinase) and ROS1 (c-ros oncogene 1) inhibitor, approved for treatment of some non-small cell lung carcinoma (NSCLC) in the US and some other countries, and undergoing clinical trials testing its safety and efficacy in anaplastic large cell lymphoma, neuroblastoma, and other advanced solid tumors in both adults and children. 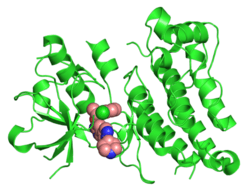 Crizotinib has an aminopyridine structure, and functions as a protein kinase inhibitor by competitive binding within the ATP-binding pocket of target kinases. About 4% of patients with non-small cell lung carcinoma have a chromosomal rearrangement that generates a fusion gene between EML4 ('echinoderm microtubule-associated protein-like 4') and ALK ('anaplastic lymphoma kinase'), which results in constitutive kinase activity that contributes to carcinogenesis and seems to drive the malignant phenotype. The kinase activity of the fusion protein is inhibited by crizotinib. Patients with this gene fusion are typically younger non-smokers who do not have mutations in either the epidermal growth factor receptor gene (EGFR) or in the K-Ras gene. The number of new cases of ALK-fusion NSLC is about 9,000 per year in the U.S. and about 45,000 worldwide. ALK mutations are thought to be important in driving the malignant phenotype in about 15% of cases of neuroblastoma, a rare form of peripheral nervous system cancer that occurs almost exclusively in very young children. Crizotinib caused tumors to shrink or stabilize in 90% of 82 patients carrying the ALK fusion gene. Tumors shrank at least 30% in 57% of people treated. Most had adenocarcinoma, and had never smoked or were former smokers. They had undergone treatment with an average of three other drugs prior to receiving crizotinib, and only 10% were expected to respond to standard therapy. They were given 250 mg crizotinib twice daily for a median duration of six months. Approximately 50% of these patients suffered at least one side effect, such as nausea, vomiting, or diarrhea. Some responses to crizotinib have lasted up to 15 months. 1 2 "FDA approves Xalkori with companion diagnostic for a type of late-stage lung cancer". U.S. Food and Drug Administration. ↑ Forde PM, Rudin CM (2012). "Crizotinib in the treatment of non-small-cell lung cancer". Expert Opin Pharmacother. 13 (8): 1195–201. doi:10.1517/14656566.2012.688029. PMID 22594847. ↑ Roberts PJ (2013). "Clinical use of crizotinib for the treatment of non-small cell lung cancer". Biologics. 7: 91–101. doi:10.2147/BTT.S29026. PMC 3643289 . PMID 23671386. ↑ Sahu A, Prabhash K, Noronha V, Joshi A, Desai S (2013). "Crizotinib: A comprehensive review". South Asian J Cancer. 2 (2): 91–7. doi:10.4103/2278-330X.110506. PMC 3876666 . PMID 24455567. ↑ Cui JJ, Tran-Dubé M, Shen H, Nambu M, Kung PP, Pairish M, Jia L, Meng J, Funk L, Botrous I, McTigue M, Grodsky N, Ryan K, Padrique E, Alton G, Timofeevski S, Yamazaki S, Li Q, Zou H, Christensen J, Mroczkowski B, Bender S, Kania RS, Edwards MP (2011). "Structure based drug design of crizotinib (PF-02341066), a potent and selective dual inhibitor of mesenchymal-epithelial transition factor (c-MET) kinase and anaplastic lymphoma kinase (ALK)". J. Med. Chem. 54 (18): 6342–63. doi:10.1021/jm2007613. PMID 21812414. 1 2 3 "Maintenance Therapy for Non-Small Cell Lung Cancer". MedscapeCME. 2010-05-12. Retrieved 2010-06-07. 1 2 3 4 5 "ALK inhibitor crizotinib has high response rate in patients with ALK-positive NSCLC". HemOncToday. 2010-06-05. Retrieved 2010-06-07. 1 2 3 Winslow, Ron (2010-06-07). "Advances Come in War on Cancer". The Wall Street Journal. Retrieved 2010-06-07. 1 2 3 "Pfizer Oncology To Present New Clinical Data From Ten Molecules Across Multiple Tumor Types" (PDF) (Press release). Pfizer Oncology. 2010-05-20. Retrieved 2010-06-07. ↑ Janoueix-Lerosey I, Schleiermacher G, Delattre O (2010). "Molecular pathogenesis of peripheral neuroblastic tumors". Oncogene. 29 (11): 1566–79. doi:10.1038/onc.2009.518. PMID 20101209. ↑ Christensen JG, Zou HY, Arango ME, Li Q, Lee JH, McDonnell SR, Yamazaki S, Alton GR, Mroczkowski B, Los G (2007). "Cytoreductive antitumor activity of PF-2341066, a novel inhibitor of anaplastic lymphoma kinase and c-Met, in experimental models of anaplastic large-cell lymphoma". Mol. Cancer Ther. 6 (12 Pt 1): 3314–22. doi:10.1158/1535-7163.MCT-07-0365. PMID 18089725. ↑ Zou HY, Li Q, Lee JH, Arango ME, McDonnell SR, Yamazaki S, Koudriakova TB, Alton G, Cui JJ, Kung PP, Nambu MD, Los G, Bender SL, Mroczkowski B, Christensen JG (2007). "An orally available small-molecule inhibitor of c-Met, PF-2341066, exhibits cytoreductive antitumor efficacy through antiproliferative and antiangiogenic mechanisms". Cancer Res. 67 (9): 4408–17. doi:10.1158/0008-5472.CAN-06-4443. PMID 17483355. ↑ "NICE backs Pfizer's Xalkori after squeezing out a new discount - FiercePharma". ↑ Helwick (2010). "Novel Agent Demonstrates Striking Activity in ALK-positive NSCLC". NB Fig 1. 1 2 3 "Gene-based lung cancer drug shows promise". MSNBC.com. 2010-05-07. Retrieved 2010-06-07. ↑ "Crizotinib Clinical Trials – Currently Ongoing and/or Enrolling" (PDF). Fact Sheet. Pfizer. ↑ Wood AC, Laudenslager M, Haglund EA, Attiyeh EF, Pawel B, Courtright J, Plegaria J, Christensen JG, Maris JM, Mosse YP (2009). "Inhibition of ALK mutated neuroblastomas by the selective inhibitor PF-02341066". J Clin Oncol. 27 (15s. suppl; abstr 10008b).